Dr Evoes Shop One of our many community projects. From 2014 – 2018 : Last Legs is proud to have shared so many creative experiences with the community. 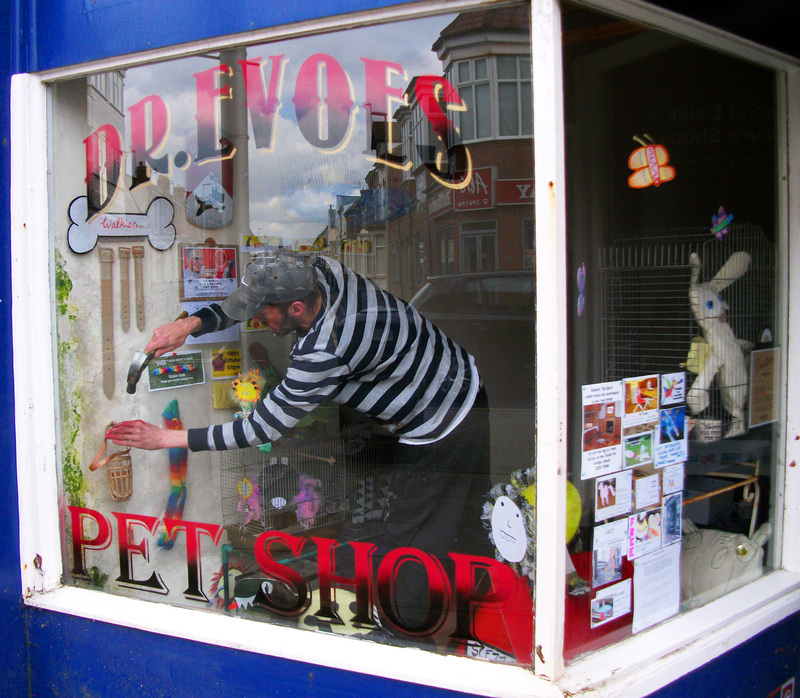 Dr Evoes shop was created as part of the ‘Blackpool Culture Shops’ project in Blackpool and was one of the first projects Boz Phillips and Lee Fitzgerald worked on together. then becoming ‘Last Legs Community Arts Organisation’. All the animals and shop fittings were created with recycled materials. The sign on the shop window was created as a historical reference to the traditional hand painted shop window signs and utalised a ‘classic’ font. This was painted by Mr Dee. When available Lee Hodgkiss is our official photographer and secretary for Last Legs. Lee helps out as at larger community events. We are DBS cleared, have public liability. We also have a child protection policy in place. David Jennings is the latest member of our team and provides help support and knowledge when we are building walls and items that require woodwork skills.